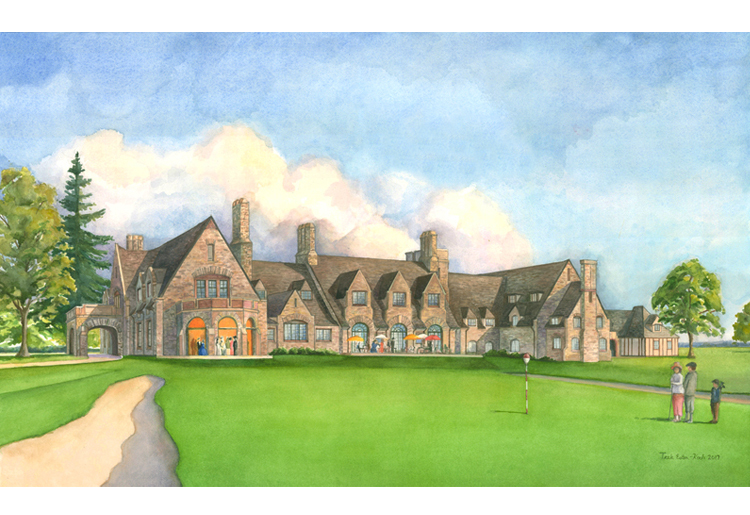 One of my recent projects was a commissioned watercolor rendering for Winged Foot Golf Club, located in Mamaroneck, NY. The Club sought a renderer to reproduce an original watercolor illustration of the clubhouse by architect Clifford C. Wendehack. The physical illustration had been lost and only a small digital file was available. The new rendering will be featured inside the renovated clubhouse as the Club prepares for its centennial in 2023. The challenge for the project was identifying and correctly illustrating the original clubhouse as built in the 1920s. At the invitation of General Manager Colin Burns and Executive Assistant Anne Drake, site visits were conducted to review and photograph the clubhouse as it currently stands. Successive additions and alterations to the clubhouse obscure or have eliminated some of the original structure. As a team, we reviewed historical photographs from the club archives and compared our findings to the original illustration. We discovered Mr. Wendehack’s rendering was most likely completed before the clubhouse was constructed, as there were chimneys and dormers that were never built. When painting the final rendering, my job was to review and synthesize all the research to accurately reproduce the clubhouse view. All parts of the watercolor were considered including the species of trees, period attire of golfers, and the historically accurate wicker basket pin used to mark the hole on the green. Detailed View featuring Wicker Pin and Period Dress. At the same time, I utilized my skills as a watercolorist to create a final rendering that was lighter and brighter then the original work. The illustration had to be completed in stages, where each layer was carefully added without compromising the quality of light inherent to watercolor. Each layer of pigment added contrast and texture for features including the slate roof and stone veneer. The completed rendering will help tell the story of Winged Foot for generations to come. My new rendering will hang in the entry hall of the renovated clubhouse and will be featured in future club media and events.